This undeniable piece raises awareness largely to the importance of social housing and more specifically to the community in the West London council tower block. In the same vein, all profits yielded by the surviving section of the mural will be gifted to 'Artification,' a free art program for residents of Charles Hocking House and the surrounding area. A monument to the legacy of Britain’s tallest mural, Big Mother was painted by British street artist Stik in 2014, and removed and framed following the demolition of Charles Hocking House, it's supporting wall, London in 2018. As it portrays a mother carrying her child against a vigorous yellow backdrop, the present work encapsulates the artist’s much-celebrated and poetically sober style, defined by slim lines and typically sketching stick-figure characters against monochromatic backgrounds. 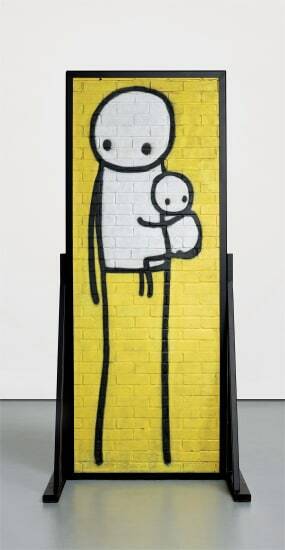 With Big Mother, Stik voiced his desire to raise awareness of the importance of social housing, and, more specifically, call attention to the community that lived in the condemned West London council tower block. To that purpose, the artist has decided to gift any profit yielded by the surviving section of the mural to ‘Artification’, a free art programme for residents of Charles Hocking House and the surrounding area. Executed in 2014, removed and framed in 2018.